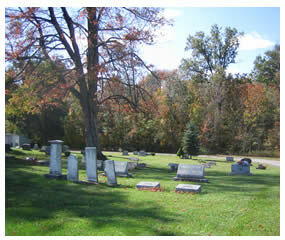 Mid nineteenth century Plain Township contained five small cemeteries and an unknown number of family burial plots. All but one of the principal cemeteries were located in the township’s northern half. Exception being the “New Albany Cemetery” found south of Rose Run on the southern boundary of the village. The small irregular shaped lot is now mostly referred to as The Old Burying Ground. By mid-eighteen-hundred most township cemeteries were filled and unable to set aside large plots for families. The New Albany Cemetery was essentially full by the late 1870s. During the winter of 1880-1881 a group of concerned citizens discussed purchasing a larger and more suitable cemetery for Plain Township’s growing community. At the March 12, 1881 annual township settlement meeting a lengthy discussion on the proposition took place. Township Trustees, Alexander Doran, F. Swickard, and John Alspach, after much assertion, ordered that the following proposition be submitted to the Electors of Plain Township at the approaching annual election. “It is hereby ordered that at the election to be held on the 4th day of April A.D. 1881 in Plain Township, Franklin County etc., the question of tax for Township Burying Ground will be submitted to the voters of said Twp. It is proposed to raise the sum of one thousand dollars in annual installments during three years. Four hundred dollars the first year, three hundred dollars the second year, and three hundred dollars the third year on the taxable property in said township. It is further proposed that said burying ground shall be locate as near the central part of the said Plain Township as practicable and it is further ordered that the township clerk shall post in at least three public places, notices to the electors of said proposition twenty days preceding said election as required by law.” Within two days Township Clerk, Alexander Carpenter posted notices at the post office, Franklin Church crossroads, and near D. B. Strait’s residence. Unfortunately for those in favor of a new burying ground, notes from the April election show the cemetery proposition “was lost”. Despite public rejection a small group of residents did not give up on obtaining a suitable cemetery. On November 16, 1881 Dennis B. and Ann Strait, Alexander and Cynthia Doran, and William F. and Lyana L. Taylor purchased part of the west half of lot number 38 containing ten acres from John and Mary F. Priest “which was known as the Jesse Kohn farm.” Each family donated 1000.00 to fund the Priest purchase. On December 20, 1881 the three families in consideration of six hundred dollars paid by the newly formed Maplewood Cemetery Association by receipt passed ownership to the association. To raise the six-hundred-dollars an auction was held selling lots of all sizes and location. Those on the small hill covered with immature maple-trees were offered first and readily sought after. If the lot was not a cemetery in the full measure of the word at least land was now ready to be transformed for the use. Plain Township at last had a sizable cemetery for all. 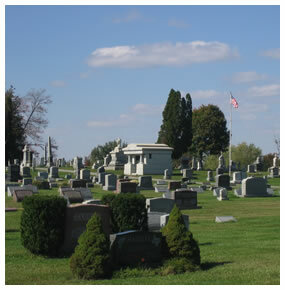 The sweeping views of Maplewood Cemtery’s entrance.Even before the cemetery association obtained control and within one week of the three families purchase the first funeral took place. On November 22, 1881 39-year-old Marinda Miller, wife of Perry, became the first to be buried at Maplewood Cemetery. Seventy-seven-year-old Rowland Evans was buried on February 28, 1882 and thirty-year-old Laura Shirk after committing suicide on January 25, 1882 was laid to rest in early April. As improvements were being made at Maplewood throughout the following years residents reentered loved ones from burials around the township. Twenty-five bodies were reentered in 1882, 39 in 1883, and 12 more in 1884. A majority of the bodies were relocated from New Albany Cemetery because of its bad situation. (Flooding near Rose Run.) Others came from small graveyards like Wagner and Jersey Church. John Swickard’s body was re-interred from an earlier burial in his orchard. Robert G. Wilson died on April 10, 1864 when a soldier serving with the18th United States Infantry during the Civil War. Following his death the remains were laid to rest at Chattanooga, Tennessee, far from home. After the war he was reentered in the New Albany Cemetery. The 18th U. S. Infantry had quite a number of Plain Township boys in its ranks. After the war local Veterans started a chapter of the Grand Army of the Republic which was a Civil War Veterans social group. It was named the Robert Wilson Post in honor of their comrade of years ago. With the creation of Maplewood, Robert’s body was once more exhumed and reburied on the front slope of the small hill, his third and hopefully final resting spot. Year after year the Maplewood Cemetery Association improved the land and driveways. Not only did the business part of selling and recording lot sales need to be kept, death certificates had to be filed with location of graves recorded. Members of the association scheduled workdays when family groups would meet at the cemetery to clean and trim unwanted growth. Small children picked up sticks, men cut grass and weeds, and the ladies gathered everyone for lunch. It was a social event as well as a workday. Every Memorial Day the Robert Wilson G. A. R. Post with help of local school children planted flowers and sat out small American Flags over the graves of their comrades. Memorial Day services were taken over by the Veterans of Foreign Wars Tri-Community Memorial Post 4719 after the Civil War Veterans had all but passed away. At a March 29, 1930 meeting of the Maplewood Cemetery Association a lawyer by the name of Chapin Beem “explained the law to the Cemetery Trustees in regard to transferring the supervision of the Maplewood Cemetery from the Cemetery Trustees to the Township Trustees and their successors in office.” Exactly what new law was discussed we are unsure but a future meeting was scheduled that day for lot owners about the situation. Legal notices were put in the Columbus Citizen to inform the public and meetings were soon held on the proposition of land transfer. On June 26, accounts of the association were balanced with $1041.25 remaining. Two days later on June 28, all real estate, equipment and accounts were transferred to the Plain Township Trustees. The Association founding families’ goal was achieved; Plain Township had a first class cemetery large enough for many family members. Over the years Plain Township smartly has added more land in anticipation of area growth. Township workers have done a wonderful job maintaining the grounds and everything is as a cemetery should be. Maplewood continues to be a stepping stone to Plain Township’s rich heritage. Within lies loved ones, soldiers, pioneers, farmers, merchants, friends, all apart of our Plain Township family.